*Notes: If you would like to take the certification exam on the last day, please select “With Review & Exam, Certificate.” This exam option must be selected a minimum of 30 days prior to the class. If you are not taking the certification exam, you may select the “Class Only, No Certificate” option any time prior to the class. The Certified Fire Plan Examiner: 3-Day Classroom Training (with Optional Certification Exam) is based on the job requirements found in Chapter 7 of NFPA 1031, Standard for Professional Qualifications for Fire Inspector and Plan Examiner, 2014 edition. This course will help the participants to perform their jobs, and along with additional study, assist them in preparing for certification examinations. Three days of practical and interactive, expert-led instruction teaches you how to apply NFPA 101®, Life Safety Code®, concepts in today's complex built environment, and sharpens your skills around code and standard requirements involving automatic sprinkler systems and fire alarm and signaling systems. The program also reviews the administrative sections of NFPA 1, Fire Code, so you understand legal issues relevant to the authority having jurisdiction (AHJ). The Certified Fire Plan Examiner (CFPE) certification exam is offered on an optional fourth day. 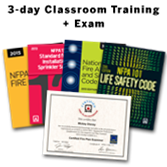 At NFPA®, we understand how important your credibility is with your employers, your peers, and the public you serve. That's why, as the code and standard developer and publisher, we offer this training program along with certification that signifies you have the experience, education, and knowledge it takes to handle the responsibilities of your job. Additional resources include: Certified Fire Plan Examiner (CFPE) Core Learning Online Training Series. Those people planning to take the CFPE certification examination, as well as fire service professionals, code officials, AHJs, insurance professionals and others expected to maintain this certification as part of their employment requirements. *These books have an approximate value of $450 if purchased separately! Earn 2.1 Continuing Education Units. Attendance is required to earn CEUs. Please verify applicability with your professional board or organization before attending. Training only Price: includes three days of instruction, student workbook, applicable codes and standards along with morning coffee and lunch each day. Note: If you wish to register for this course and certification exam, you must register a minimum of four weeks before the class date in order for NFPA to have time to order the examinations. 4 weeks before the class start, NFPA will remove the option to schedule the exam and you will only be able to register for the course after that time. If necessary, you may also contact the NFPA Certification team directly to schedule to take your certification exam at a later date.